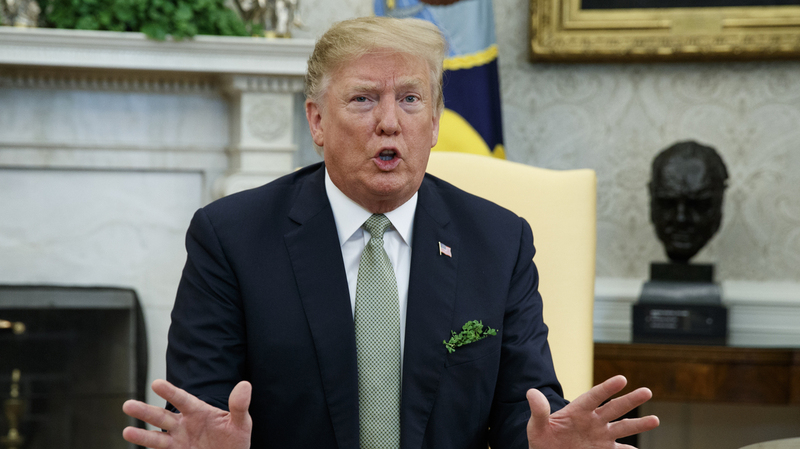 President Trump said Thursday he would "probably have to veto" the resolution blocking his emergency declaration to build a wall on the U.S.-Mexico border. Shortly after the vote, President Trump tweeted, "VETO!" Neither chamber mustered the two-thirds support required to override a presidential veto. The president also tweeted that he looked forward to vetoing the measure, which he called "Democrat inspired." But in Thursday's vote to block the president's emergency declaration, 12 Republicans voted with all Senate Democrats to pass the resolution. The Democratic-controlled House approved it last month, 245-182, with just 13 House Republicans breaking with the White House. North Carolina GOP Sen. Thom Tillis penned an opinion piece in the Washington Post on Feb. 25 saying he would vote for the resolution blocking the president's actions to go around Congress to build a border wall, but reversed himself and opposed it on Thursday. At stake is nearly $6 billion in federal funds that President Trump redirected in a Feb. 15 emergency declaration. The White House is seeking to take that money from accounts at the Treasury and Defense departments to build physical barriers along the U.S.-Mexico border. The president made the order after Congress agreed on a bipartisan basis to provide $1.375 billion in wall funds for this fiscal year, but Trump said it wasn't enough. Senate Majority Leader Mitch McConnell, R-Ky., initially counseled the president against invoking the national emergency out of concerns it would divide Senate Republicans and test the separation of powers, but he voted with the president on Thursday and defended his actions as lawful. "He has simply operated within existing law, the National Emergencies Act of 1976, to invoke a narrow set of authorities to reprogram a narrow set of funds," McConnell said. "If Congress has grown uneasy with this new law, as many have, then we should amend it." Democrats broadly oppose the wall, but have argued the resolution bends the intent of the law and the constitutional authority of Congress. "We've never had a president like this. We've had lots of presidents with lots of foibles but none of them seem to equate their own ego with the entire functioning of the government of the United States except this one. We can't succumb to that," said Senate Minority Leader Chuck Schumer, D-N.Y.
Trump said Thursday his declaration would withstand expected court challenges. "The legal scholars all say it's totally constitutional. It's very important. It's really a border security vote," he said. Many Senate Republicans aren't as sure. "Never before has a president asked for funding, Congress has not provided it, and the president then has used the National Emergencies Act of 1976 to spend the money anyway," said Sen. Lamar Alexander, R-Tenn., who said congressional authority to appropriate federal tax dollars is a "crucial source of our freedom." "This declaration is a dangerous precedent," he added. Other Republicans tried and failed to cut a deal with the White House to help defeat the resolution. There was a last-ditch effort to get Trump to agree to back legislation by Sen. Mike Lee, R-Utah, to limit presidential authority to declare national emergencies going forward, but Trump told Lee he wouldn't support it, and Democrats said they'd block it anyway. "We tried to cut a deal, the president didn't appear interested," Lee told reporters on Wednesday. He ultimately supported the resolution. The resolution is the second Senate rebuke of the Trump administration this week. On Wednesday, senators approved a resolution to end U.S. support for the Saudi-led war in Yemen, which is another rejection of Trump administration policy. The rebukes are a reflection of the new divided government in Washington, with House Democrats planning on a more confrontational approach to a president than congressional Republicans, who worked hard to accommodate the president's agenda during his first two years in office.